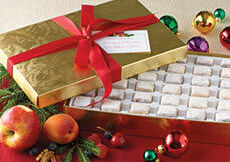 The most variety... our 12-flavor assortment of fruit & nut candies! We've combined our most popular flavors in one elegant gift box, so your gift recipients can explore the delicious variety of our candies at their leisure. 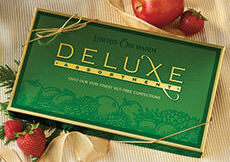 Our customers tell us that the fun of finding their favorite combinations makes this gift especially memorable! Under the shiny foil lid they'll find a dozen of our classic fruit-and-nut candies: Aplets & Cotlets, Pineapple-Macadamia, Raspberry-Pecan, Peach-Walnut, Orange-Walnut, Cherry-Pecan, Strawberry-Walnut, Blueberry-Pecan, Cranberry-Walnut, Banana-Macadamia, and Coconut-Macadamia. It's a gift of variety and good taste that's sure to be appreciated! Kosher. INGREDIENTS: sugar, corn syrup, nutmeats (walnuts, pecans, macadamias, cashews), modified corn starch, fruit [fruit juice from concentrate (peach, strawberry, apple, blueberry, raspberry, cranberry, cherry, apricot), cranberries, candied orange peel, dried cherries (cherries, sugar, sunflower oil), pineapple, raspberries], pectin (pectin, disodium diphosphate, sodium polyphosphate, dextrose, dicalcium phosphate), natural flavors, dried coconut, sodium citrate, citric acid, malic acid, soy lecithin. ALLERGEN INFORMATION: May contain traces of peanuts and tree nuts not listed in the ingredients. Our macadamia nut confections include a small amount of cashews. I live in Maryland and went to Ohio to visit my 105 yr old Grandmother. My Aunt sent the Deluxe box to her and OMG I wish she hadn't shared with me. I did not see whom these were made by and have been searching on Google for weeks and all day as I can't get the awesome flavors out of my mind! Love your store - visited last Dec on a bus tour and wow. Bought boxed candies..chocolate covered and the icing sugar type. Would like to buy some..do u ship to Canada. Prefer boxes instead of bags....thank you. My mother began buying these for holidays many years ago. Now I buy a large box each year for my office cohorts, and they love them. Always ask if I'm planning it again. They have been a hit. But one taste, and I changed my mind (someone brought them to work). And that solved my gift problem, got a box for everyone on my list and one for myself. As good as chocolate, but better in that I can have a piece or two and wait for later to have more, so they last longer. They satisfy rather than starting a binge. Great stuff!!! Almost all the varienties lacked discernable fruit flavor. Some of them, like blueberry and strawberry only had the faintest tinge of color. This was also true of the Turkish Delight. 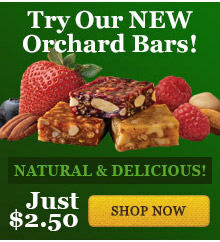 The only items that retained former quality were the Almond Buttercrunch and the Blueberry Pomegranate Orchard Bars. Don't waste your money. Wow! I must admit that I rarely pass up an offer this good. 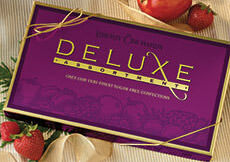 When these wonderful confections are offered to me, on sale, it's what you call a "win-win" deal. The most delicious and fresh-tasting goodies at the best price. They are so good. I occasionally think of giving them as a gift, but mainly, I give them to myself as a special "attaboy" when I've gotten through some challenging times. Thanks, Liberty Orchards! My oldest daughter gave me a box of these candies for Easter. I remember enjoying Turkish Delight candies as a youngster and I was looking forward to trying something similar. Last night I opened the box to have some with my wife and there was a strong foul oily smell to the candy. We didn't even get to taste them because we had to throw them out. I'm so dissapointed. What a waste! I have heard such good things about these but we were very unhappy. Liberty Orchards Reply: We're very sorry about this, and apologize for your unpleasant experience. This is very unusual, and we'll make it right. One of our Customer Service staff will be in contact with you. Thank you for this feedback. I just submitted a review, but it struck me that the candies may have been in little paper cups rather than fully wrapped. If so, those little cups could be given separate colors according to the type of candy. Liberty Orchards Reply: This is a great idea, and we've looked into it before. Unfortunately, the manufacturer of "crinkle cups" requires a minimum order of a gajillion cups per color. Far more than we could ever use. The candies need some way of identifying themselves as to flavor. My parents were uncertain what flavor they were eating. They wanted to know. Perhaps the candies could be wrapped in various colors with a code indicating the kind of candy each color represented. This would raise the rating to a five for me. Liberty Orchards Reply: Thanks for your review. We're sorry that your parents weren't able to identify the flavors, but we do include a flavor "map" in each box of candy. It sits on top of the candy tray, and labels the flavors by row. Possibly, your parents we're so anxious to enjoy the candies that they pulled the flavor guide off before studying it! Absolutely awesome. Given to my 93 year old mother as a gift for Christmas. Didn't think the candies would be so good. Once you take your first bite, you are hooked. Best candy I have ever had. Better than chocolate. And, that's saying a lot from a chocolate lover. Refreshing product with a good variety. 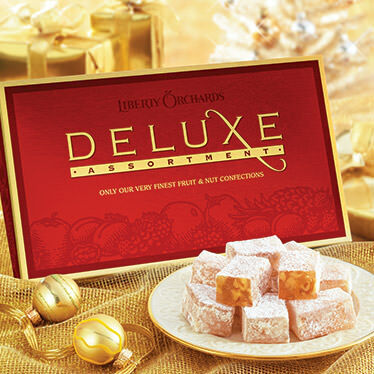 My mother-in-law gave me the Deluxe Assortment for Christmas and they are absolutely fabulous, the best pieces of candy I have ever put in my mouth. Such a neat, fun, different tasting candy. The fruit & nut combination is really tasty!